What can you say about a man whe runs around at night in a bright yellow ambulance with “The Bee Man” painted on the side and a stuffed bee clinging to the inside of the window? That he’s the bee’s knees? That he’s seen “Ghostbusters” one too many times? Or, more likely, that he has bees in his bonnet? None of the above seems to fit the man who welcomes a visitor to his Brookfield ranch home; the one with the Bee Van parked outside. Curt Jepson is as laid back as bees aren’t. Friendly and relaxed, Jepson, 47, settles into an easy chair to explain how he’ll be spending his nights from now until the first of November collecting wasp nests in the Milwaukee area and beyond. Despite the flamboyant yellow ambulance, Jepson’s is not an eccentric pastime, but a serious pursuit. He sells the wasps he collects to a Pennsylvania firm, Vespa Laboratories, which uses them to make vaccine that desensitizes people who have life-threatening allergic reactions to wasp stings. 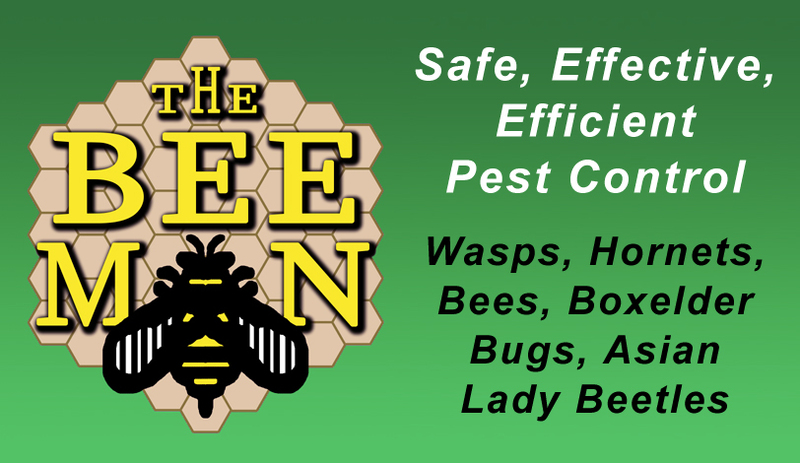 Early on, Jepson was dubbed “The Bee Man” when his name came up on Gordon Hinkley’s WTMJ-AM radio show “Ask Your Neighbor” and, despite Jepson’s concentration on wasps, that name has stuck. Jepson concentrates on one type of wasp, the bald-faced hornet (despite the name, it’s not really a hornet but a wasp, he says), which is common in this region. He removes the hornet nests, which he can identify by asking a couple of questions over the phone, free of charge. The nests — light, delicate creations made of wood fiber and saliva — usually are found attached to the branches of trees and sometimes on houses. Jepson collects the nests at night because that’s when they are full of wasps. Removing a wasp nest the size of a very large watermelon from a tree branch is not for the faint of heart. “I was scared to death the first time I did it,” Jepson says. By trial and error, he has perfected his routine so that today he can remove a nest in 10 or 15 minutes. First, the clothing. He dons jeans and a flannel shirt, and tops them off with a coverall or jumpsuit. His pants are tucked into boots, and on his head he wears a hat with veil that zips onto the coverall. Leather glov es complete the protection. Once at the scene, he sets up a light and ladder, prunes away branches around the nest, then gently cuts the branch holding the nest. It goes immediately into a plastic garbage bag that is secured tightly and placed in a freezer in the back of the ambulance. The freezer is crucial, since wasps’ venom bags deteriorate quickly. At home, he transfers the nests from the ambulance freezer to a large freezer in his garage. Later his daughters, Leah, 18, and Rachel, 16, quickly dismantle the nest. The wasps go into plastic zip-lock bags and stay frozen until they are shipped in dry ice to the laboratory. Rachel also works as his secretary. Jepson’s wife, Leslee, doesn’t get involved – she likes wasps only at a long distance. This is the start of the height of the season, during which Jepson will remove as many as half a dozen nests in one night. His record is 13 in one night. Yes, he has been stung. And, no, he doesn’t like it. But he blames himself: “When I get stung it’s because I wasn’t as cautious as I should have been,” he says. Once – the only time he nearly dropped a full nest – he was stung simultaneously on both shoulders through the shirt and coverall he was wearing. He also has been stung through the leather gloves. It’s reassuring to know that most people can run faster than wasps fly. One of Jepson’s more clever maneuvers when he was chased by wasps was to run through the branches of a willow tree. He knew the wasps would get lost in the leaves and branches. 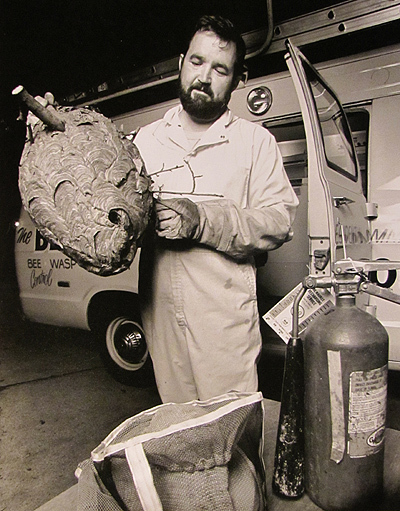 A computer systems analyst by day, Jepson got into the wasp business in 1980. He had just graduated from Marquette University with a business degree and was looking for a way to make a little extra money to supplement his full-time job. When his brother, Chris of Briggsville, who was a beekeeper, read about the need for wasps in a trade magazine, he suggested Jepson give it a try. It took the mention on “Ask Your Neighbor” to get things rolling. Naturally, people with wasp problems were thrilled to learn about Jepson’s service. Six or seven years ago, when the demand for wasps dropped precipitously, Jepson decided to expand his repertoire. 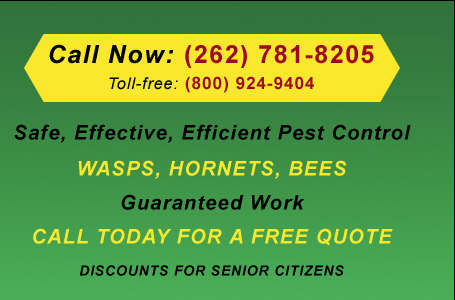 He began a for-profit pest-control business, concentrating on the removal of wasps, bees, hornets and carpenter ants. State certified for six years, he works at pest removal just about every minute that he isn’t working his regular job or sleeping during this time of the year. This summer the market for wasp venom is strong once again, so he is looking for as many as 400 nests. (Shifts in demand for bald-faced hornets are related to production plans of pharmaceutical companies, said a spokesman for Vespa Laboratories. Demand for the vaccine has been steady.) The mild winter means that there should be a good supply. Jepson personally removes nests in the Milwaukee metro area, including Waukesha, Port Washington, Racine and Kenosha. He also will arrange to have nests removed for people in Madison, Green Bay and Antigo. For Jepson, this means very little midsummer night’s dreaming. One of these days when he gets the time, he says, he’s going to go back to a hobby he loves. You guessed it: beekeeping.